Charles Paul Gruppé (1860-1940) was born in Picton, Canada, but his love of painting drew him to Europe where he eventually settled in the fishing village of Katwyk Ann Zee in Holland. His skill with paint and his superb draftsmanship were appreciated by the Dutch Royal Family, and he was elected to the Hague's Pulchre School. Of Gruppé Sr.'s four children, three achieved recognition as artists (his son Paulo was a gifted cellist). 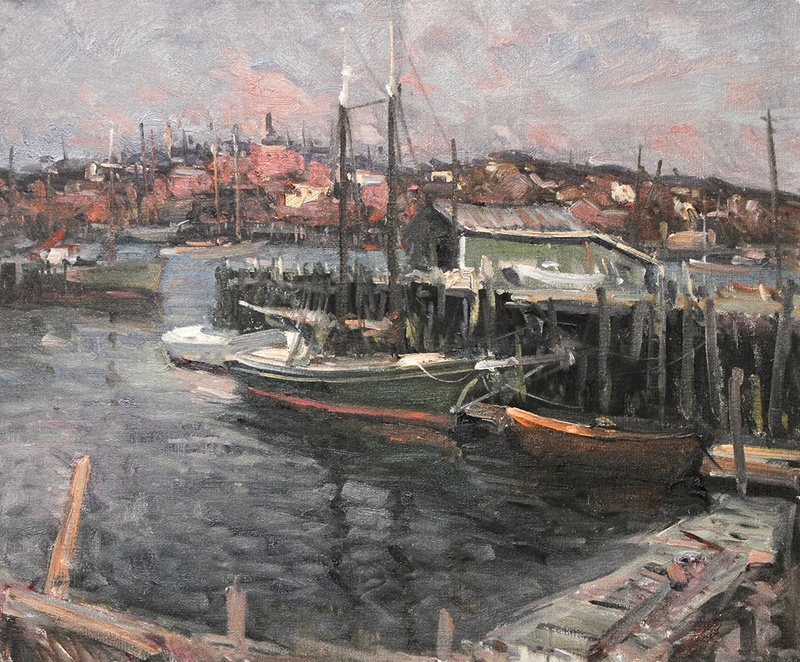 Emile (1896-1978), inspired by Frederick Mulhaupt's Gloucester harbor paintings, moved to Rocky Neck. He was later joined by his father, his brother Karl (1893-1982), and their sister Virginia (1907-1980). Karl served as the Chief Sculptor of Monument Restoration in New York City. 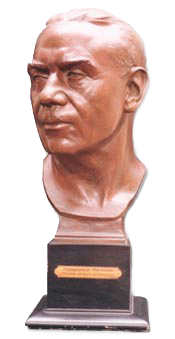 He studied at the Royal Academy in Belgium and was President of the National Sculpture Society. His bust of his brother Emile (below right) is a fine example of his talent for portraiture. Virginia studied with her father as well as at Cornell and the University of Rochester. She worked in sculpture, creating small, perfectly detailed figures, and in watercolor. All of the Gruppés at one time or another worked in Emile's Rocky Neck studio - now The Gruppé Gallery. Emile Gruppé had the distinction of being not only an accomplished artist but a dedicated teacher. He ran the Gloucester School of Painting from 1940 until 1970 where over 7,000 painters studied and attended his vibrant demonstrations. Emile is remembered by many artists of Cape Ann for his flamboyant personality and inspirational teaching style. I was extremely fortunate to have studied painting with my father for twenty years, and I would not trade it for the world. At my first interest in learning to paint, Dad saw the need for studying drawing to train my eye and I was sent to George Demetrios. While continuing my classes in drawing, I began apprenticing with my father all the while learning his philosophy of painting and learning his evolutionary process. When I first started painting he told me, "I can teach you everything I know about painting in five minutes if I talk slow, but you will remember what I said when you discover it for yourself." Emile was more academic in his early years. Later in life, he used terms like, "Get the big effect! You can put paint on with your foot if you get the color and value right." This spirit of expressive painting was the culmination of 6,000 students and 60 years painting on location. Expressive brushstrokes, lost and found edges (the Dutch called hide and seek edges) truthfully relate the big masses. One's own mannerisms and aptitudes come forth and set us apart as individuals.